Second quarter earnings season will be tricky for investors to decode. On the one hand, the raw numbers from Corporate America are likely to look impressive. Credit that to lingering effects of Trump's tax plan and global economic momentum ahead of the start of the trade war in the third quarter. Profit margins are forecast to expand by 88 basis points to an all-time high of 10.9% says strategists at Goldman Sachs, aided by a 14 percentage point reduction in the statutory corporate tax rate. Sales are expected to rise by 11%, Goldman notes, which would be the fastest pace of year over year revenue growth since the third quarter of 2011. Pre-tax profits are seen climbing by 13%. Corporate guidance will be the wildcard this earnings season. With trade tensions (and first round impacts of the U.S./China trade war) running high around the world, Corporate America may opt to strike a cautious tone in its outlook for the balance of 2018. In turn, that may put pressure on stock prices. To survive what is shaping up to be a turbulent earnings season, investors should focus on those companies with a track record of defying the odds. That means companies that have shown a capability to exercise pricing power on their goods and services, slash costs and profitably take market share. 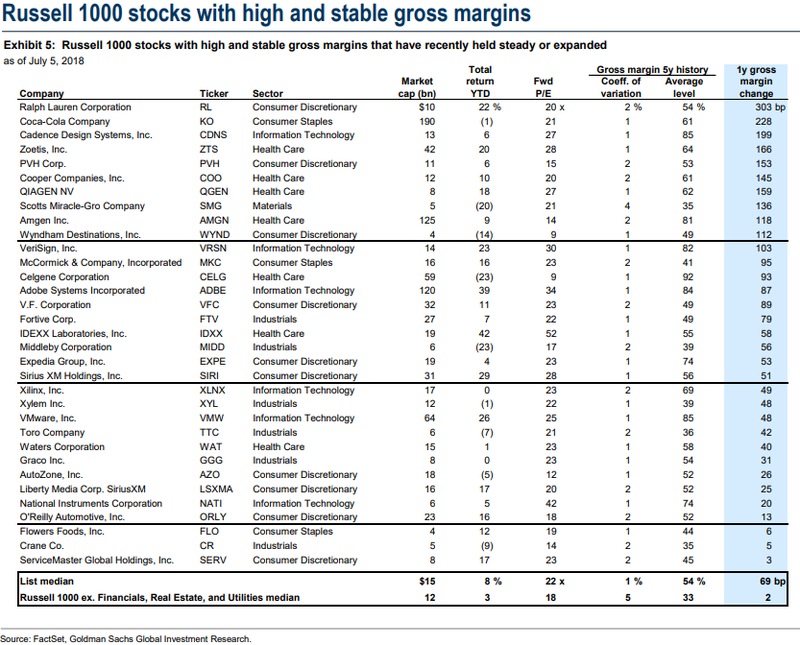 The below list of more than 30 plus companies via Goldman Sachs spotlights businesses that have been winning the past year, which could be seen in their gross profit margin expansion/stability. It's these companies that have the best shot at overcoming trade tensions and inflation, among other negative macroeconomic factors. Sign up for the free 'Morning Jolt' daily newsletter here.